Thorsten Kahnt, PhD, assistant professor in the Ken & Ruth Davee Department of Neurology, was a co-author of the study published in PLOS Biology. Within the brain, the ventral striatum, a part of the basal ganglia, acts as a gatekeeper for behaviorally relevant reward dimensions, according to a study published in PLOS Biology. 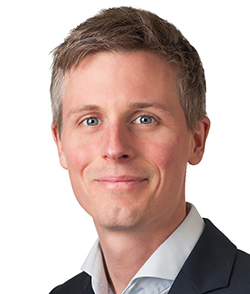 Humans make reward-based evaluations of items to inform behavior, and the ventral striatum’s (VS) ability to flexibly encode reward types helps ensure the most beneficial behavior, according to Thorsten Kahnt, PhD, assistant professor in the Ken & Ruth Davee Department of Neurology and a co-author of the study. The relative value of rewards is derived in part by assigned dimensions such as gains and losses, pleasantness or salience. Early studies suggested that independent brain regions processed and assigned these dimensions in parallel, but exactly how the brain did this was unknown. In the current study, Kahnt, along with collaborators from the University of Zurich, used functional neuroimaging to investigate how humans assigned two common reward dimensions; hedonic (liking) or motivational (wanting). Over the course of a behavioral task, study participants indicated how much they liked or wanted various everyday items. Using functional MRI, the study authors measured neural activity in the prefrontal cortex and the basal ganglia. They found that activity in the prefrontal cortex encoded both reward dimensions, with slight regional differences. In contrast, the VS correlated with liking ratings when study participants evaluated how much they liked an item, and correlated with wanting when participants evaluated how much they wanted it. According to the study, this indicates that the VS is where the reward dimension is encoded, depending on what is required for behavior. In addition, brain activity suggests that this flexibility is achieved by gated input from those active prefrontal regions into the VS. Both hedonic and motivational reward dimensions converge at the VS, and are passed on to other brain regions in a focused and selective manner, simplifying action selection, according to Kahnt. “These findings provide evidence that fronto-striatal circuits are not operating in strictly segregated and parallel loops, but that they have considerable overlap that facilitates a flexible gating of reward information,” said Kahnt, who is also an assistant professor of Psychiatry and Behavioral Sciences. These findings provide a prototype for a context-dependent information selection mechanism that may be used elsewhere in the brain, the authors said. In addition, this shows the brain not only can select actions, but can contextually select how those actions are valued during the decision-making process — a finding that may have implications in other behavior selection processes. “Future studies will focus on the exact mechanisms that enable flexible gating of reward information, as well as on how impairments in these circuits could give rise to neuropsychiatric conditions such as addiction and obsessive compulsive disorder,” Kahnt said. This study was supported by Swiss National Science Foundation grants PP00P1128574, PP00P1150739 100014165884, PP00P1123516 and PP00P1146326.